Another round with five draws in Shamkir. | Photo: Shamkir Chess. After losing a winning position the other day, Shakhriyar Mamedyarov avoided another loss today as he escaped from a difficult endgame against David Navara. 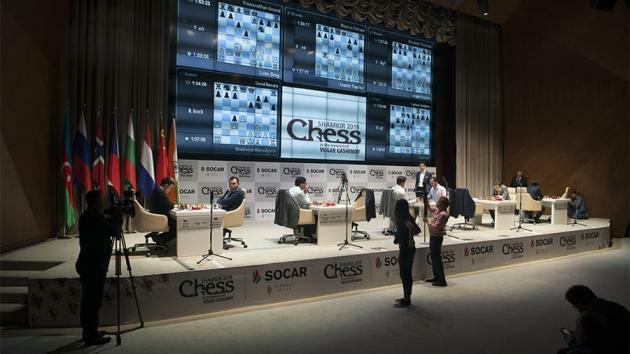 All other games were also drawn in round four of the Gashimov Memorial in Shamkir, Azerbaijan. The fourth round started with something odd. From different openings, two games finished at almost the same time, and in almost the same final position. Sergey Karjakin vs Alexander Grischuk was an Exchange Gruenfeld starting from 1.Nf3. It was already there that Karjakin was surprised as 1...d5 allows 2.d4 "and there are some openings that Alexander doesn't usually play," he said. The middlegame was very symmetrical, but looked simpler for Black than it was. Grischuk was fortunate to have looked at it earlier this week. "I got slightly lucky because it's the line I looked at before the game against Ding Liren," said Grischuk. Grischuk was fortunate that he could use preparation for an earlier game. | Photo: Shamkir Chess. Grischuk said he found the only clear way to play while "everywhere Black is worse otherwise." He argued that White would have been significantly better if he could have gotten both a2-a4 and h2-h4 on the board. Grischuk didn't think the quick draws are a big problem, except if someone really plays one after another. "Just one or two or three is fine," he said. "Even Botvinnik said that you should not try to show your maximum in each game; you should try your maximum in the competition or maybe even in the season." Grischuk: "Even Botvinnik said that you should not try to show your maximum in each game." | Photo: Shamkir Chess. Veselin Topalov vs Magnus Carlsen was a Queen's Gambit Declined, Ragozin variation where all play in the position quickly vanished. "There's not much to say," said Carlsen. "15...Re8 was an important move after which it was a dead draw." Topalov: "That's the problem with slow chess. It kills.. many lines are closed. It's not so easy to find good ideas." Topalov couldn't get any opening advantage today. | Photo: Shamkir Chess. Carlsen's comment on their final position being almost identical as the first game that had finished: "I was a little bit disappointed because I wanted to have the same final position." His opponent hadn't seen the end of Karjakin-Grischuk, though. "I didn't know, otherwise I would have played it!" A selfie with the world champion. Henrik Carlsen is in the middle of the photo. | Photo: Shamkir Chess. Vishy Anand was better for most of the game against Ding Liren, but it proved to be very difficult to achieve a position that was actually winning. Whereas Grischuk's early g2-g4 the other day was new, Ding's 9.g4 in the Exchange QGD had been played as early as 1993. Anand saw it coming, reacted strongly and was better after finding 13...a5!. Anand was doing quite well out of the opening. | Photo: Shamkir Chess. In the game there were many alternatives for both sides, and perhaps Anand could have limited his opponent's counterplay somewhere, but it was never easy. He said the positions were difficult to evaluate. "I had the feeling I can be better, maybe much better, but if he gets his counterplay things can turn very fast," said Anand. Anand: "I had the feeling I can be better, maybe much better." | Photo: Shamkir Chess. Anish Giri and Teimour Radjabov were the next to finish after drawing another Queen's Gambit Declined, this time a 5.Bf4 variation with 7.c5, which closes of the queenside. The line was quite popular some years ago and has quite a drawish reputation. Giri is one of the players who has tried it as White many times. Giri said: "It's a fun position to analyze, because you can always try something and then you can take the move back and try something else but it is a little harder to play. I've been playing this many times and I've been pushing in many games. It's very hard to choose the right plan at some point. I thought I had a promising position." Giri: "It's a fun position to analyze (...) but it is a little harder to play." | Photo: Shamkir Chess. If there was any pawn break with g3-g4, it was very difficult to choose when, and it would always involve some risk. Radjabov felt he would be ready to meet it with piece play, but also acknowledged that it's not fun to play this line as Black. "The only thing that made me happy is that I knew the position should be fine for Black," said Radjabov. Giri also argued that the a-file is less important for Black than in the old days. "I know how to neutralize Black's activity but I don't yet know how to win this position. Maybe in a couple of years I will eventually evolve!" Radjabov "successfully suffered" a bit as Black today. | Photo: Shamkir Chess. The longest and most interesting of the draws was Shakhriyar Mamedyarov vs David Navara, another Ragozin in the same round. After an exciting middlegame, Navara was a pawn up in an endgame with RN-vs-RN for a long time. There was one moment, deep in the rook ending, where Navara had a clear win, and so we can say that Mamedyarov escaped today. Clearly the game of the day: Mamedyarov-Navara. | Photo: Shamkir Chess.